This is the 2002 German paperback edition of Hunting Badger, Hillerman's fourteenth Navajo Mystery novel featuring Joe Leaphorn and Jim Chee of the Navajo Tribal Police. This edition was published by Rowholt Taschenbuch Verlag GmbH in Hamburg, Germany. The text was translated into German by Fried Eickhoff. The cover was designed by Walter Hellman and illustrated by Jürgen Mick. 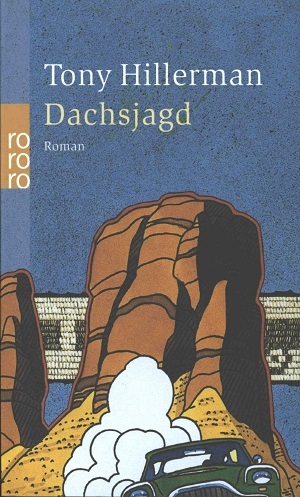 The cover on this paperback edition consists of a larger version of the lower right hand section of the dust jacket illustration which features a car driving away from a sandstone rock formation in front of a woven belt. Binding: Paper covers with full color illustration. The author, title and publisher's logo are printed on the spine above a section of the illustration.